How much do diving watches cost? What does water resistance mean? You don't have to be a diver to appreciate a diving watch's water resistance, robustness, and sporty looks. 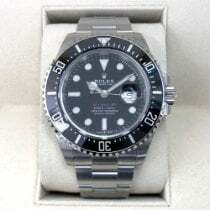 Models like the Rolex Submariner and the Omega Seamaster have been top-selling luxury watches for years. At first, diving watches were special instruments made specifically for divers. Since their development, however, they've earned an established place in everyday life. Their functionality, technology, and water resistance are all strong arguments for buying this kind of watch. To be considered a diving watch, a watch has to meet the standards set forth by ISO 6425 or DIN 8306. Water resistance to 200 m (20 bar, 656 ft) is the minimum requirement. To keep the water at bay, diving watches have screw-down case backs and crowns. Chronographs – a.k.a. watches with a stopwatch function – also feature screw-down push-pieces. Together with rubber O-rings, these screw-down pieces ensure that the watch is hermetically sealed. Diving watches often feature a helium escape valve, which is required for saturation diving. This valve releases the helium that enters the watch, thus avoiding any potential damage. An essential part of any complete, modern diving watch is a unidirectional bezel with minute and five-minute markers. They help you to keep track of your dive time so you know when you need to resurface. Since you can only rotate the bezel counterclockwise, it's impossible to accidentally stay underwater longer than intended. These watches have to be readable underwater and in the dark. Therefore, they feature luminous hands and indices. A common solution for making sure the wearer knows their watch is functioning in the dark is to outfit the watch with a luminous second hand. Standards for diving watches also include high levels of shock resistance as well as protection against magnetic fields and changes in temperature. Altogether, diving watches have to meet around 20 different criteria. The most difficult part of buying a diving watch is choosing which one you want. 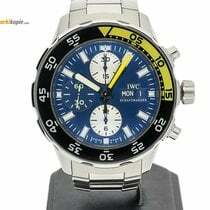 Nearly every high-quality manufacturer offers this type of watch. 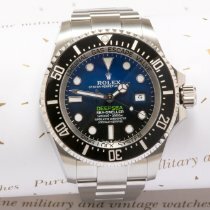 It is difficult to say which diving watch is the best. That said, the most famous is clearly the Rolex Submariner. It is both a status symbol and investment all in one. You can purchase the Submariner in stainless steel, white or yellow gold, or as a bicolor model. You can also choose from models with or without a date display. Depending on the edition, prices range from 7,000 to 29,200 USD. However, well-maintained vintage models from the 50s or early 60s can easily cost up to 92,300 USD. Similar to the Submariner, Blancpain's Fifty Fathoms has enjoyed its legendary reputation for decades. It is considered the world's first diving watch because it was not only water resistant but also developed specifically to meet the needs of divers. Here you will find an equally wide variety of timepieces. You can purchase a simple three-hand model in stainless steel starting around 4,700 USD. For a gold chronograph, however, you will need about 26,900 USD. The Omega Seamaster and the Breitling Superocean have also been established names in the world of diving watches for around 60 years. Both come in a number of different models with an equally diverse range of prices, spanning from about 1,200 USD for basic models to around 35,000 USD for intricate gold or platinum editions. Diving watches don't just come from Switzerland. Models from German manufacturer Sinn also have an excellent reputation. Professional divers are especially fond of the watches in the 'U' series, which are made of submarine steel and are relatively affordable at 2,000 to 3,400 USD. This is also true of watches from the trusted Japanese brand Seiko. 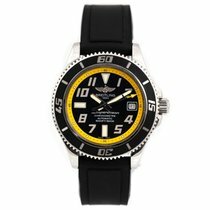 Their Prospex collection offers a wide selection of sturdy diving watches with great value for money. Some models even sell for under 600 USD. That being said, those with Seiko's unparalleled Spring Drive can cost over 3,500 USD. The Luminor from Italian luxury watch manufacturer Panerai enjoys cult status. This company has been developing watches for underwater use since the 1930s. Their angular pillow shape and large crown protector make them hard to ignore. In the beginning, these watches were reserved exclusively for the Italian Navy. Eventually, they would become available to the general public. The only true diving watch in the Panerai family is the Luminor Submersible, as it is the only watch to feature a diving bezel. Every other timepiece in their catalog lacks this feature. 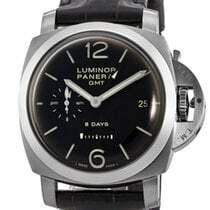 Be prepared to spend between 5,800 and 7,000 USD for a Luminor. Water resistance is so much more than just a luxurious extra. If moisture finds its way into a watch case, it almost always causes damage, regardless of the type of watch. Water washes away the lubrication and causes corrosion in mechanical watches. Quartz watches are just as sensitive; they require energy from a battery or solar cells which will likely stop working if they come into contact with water. When it comes to diving watches, the depth indicated for the water resistance is often misunderstood. This number actually refers to the amount of pressure a watch can handle, which is the same pressure experienced at the indicated depth. A watch that is water resistant to 30 m (98 ft) can survive three bar of pressure. Such watches should only come into contact with splashes and light rain at most. You should even be careful while washing your hands, as the water pressure from a faucet can exceed three bar. This also applies to swimming, surfing, and rafting. These activities put a watch's water resistance to the test and should only be undertaken with watches water resistant to at least 100 m (10 bar, 328 ft). The water resistance of a diving watch should be checked regularly. This applies especially to pre-owned watches, whose water resistance can no longer be guaranteed. Now that diving computers exist, most divers use water-resistant watches as a backup. However, it's still essential that the watch is in good condition for diving. Which was the first diving watch? There are many answers to this tricky question. Rolex patented their idea for a watch with a screw-down crown and case back and sealed gaskets in 1926. When Mercedes Gleitze attempted to swim the English Channel in October 1927, she was accompanied by a Rolex Oyster. Rolex's advertising stunt worked, as the watch withstood multiple hours underwater. The first watch that was specially developed for use underwater was the Omega Marine. Its rectangular case was made of two differently sized parts which were fit together. This design improved water resistance. In 1937, the Omega Marine became the first watch to receive an official certificate of water resistance. It was confirmed to be water resistant to 135 m (443 ft). Diving watch technology improved in the 1950s and increased the water resistance limit to 200 m (656 ft). 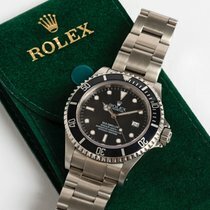 The Rolex Submariner and the Blancpain Fifty Fathoms premiered in 1953. Their designs and looks still influence the characteristics of diving watches to this day. The original versions of both watches featured a rotatable bezel so that divers could keep track of their dive time. It's still disputed today whether the Submariner or the Fifty Fathoms should be considered the first "real" diving watch. In 1957, these two watches gained some competition when the Superocean from Breitling and the Seamaster 300 from Omega were introduced. The demand for diving watches increased with the rise of offshore construction of things such as pipelines and offshore platforms. The military also requested water-resistant watches for their maritime forces. Later, that demand increased due to recreational diving, a sport now enjoyed by millions. Diving watches have since found a new use as solid sports watches and status symbols, which could make them desirable collector's items in the future.